Imagine looking out your window atnight and seeing thelights of Paris blaze bright, while fog creeps toward London and thenorthernlights dance on the horizon. Most of us regular Earthbound folkswill never get such aspectacular view. But we can enjoy it second-hand, thanks to a NASAastronautwho's been sharing his dazzling photos from the InternationalSpace Station via Twitter. Doug Wheelock, commander of thecurrent crew on the station,tweets under thename Astro_Wheels. He shared this amazing photoof the northern lights,London and Paris at night. 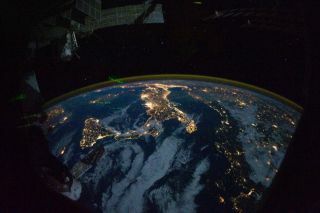 "Aurora Borealis in the distance onthis beautifulnight over Europe," Wheelock wrote about the snapshot. "It isincredible to see the lights of the cities and small towns against thebackdropof deep space." Wheelock also took thispicture, which clearly shows Florida on a calm, clear night. "The Florida peninsula and thesoutheastern U.S. on thekind of evening that I miss most about our planet," Wheelock wrote. "A clear autumn night with moonlight over the water and the sky filledwith a billion stars." In this spectacularpicture, the Nile River and itsdelta, bejeweled with the lights of countless settlements, look like aflowerbending in a slight breeze. "A night view of the Nile Riverwinding up through theEgyptian desert toward the Mediterranean Sea, and Cairo in the riverdelta," Wheelock wrote about the image. "Such a stark contrastbetween the dark desolate lifeless desert of northern Africa and theNile Riverteeming with life along its shores." This last photoshows the eastern reaches of theMediterranean Sea, its shores choked with ancient cities. "A clear starry night over theeastern end of theMediterranean Sea," Wheelock wrote. "Ancient lands with thousands ofyears of history stretching from Athens, Greece all the way around theMed toCairo, Egypt." The flow of amazing photos fromWheelock will dry up soon.He's been aboard the space station since June, and his time there isnearly up.Wheelock is scheduled to returnto Earth next week, along with fellow NASA astronaut ShannonWalker andRussian cosmonaut Fyodor Yurchikhin. The trio are slated to land theirRussian Soyuz TMA-19 spacecapsule on the central steppes of Kazakhstan on Nov. 25 ? ThanksgivingDay. It's clear from his tweets thatWheelock has appreciated thespectacular view out his window for the last five months ? and thatleavingwill be painful in some ways. "I am going to miss this view of ourwonderfulworld," he wrote.